Just like many metropolitan city, Singapore is one of the fastest growing Southeast Asian countries. This post is not blabbering about the economic growth, but something I like about the city, personally. Living in Singapore for 20 months, I try out many things in the eye of an explorer. I love travelling however skeptical about what are the things being introduced in bookshop’s travel guide. And that’s also the reason why I do not like to go on group tours by travel agents if I can. Here's some of my personal recommendations if you wish to visit Singapore. #Orchard Road. Here you can get everything you need from head-to-toe, and it's always the place I go to when I need shopping! All you can get from Local Designers to International Designers, prices from High Street to Luxury. It is the quirkiest place I've been to in Singapore. Click here to read about my blog post for it. I'm always into modern art and design stuff. When I know about the existence of this museum, I paid a visit and get inspired. I have lots of inspiration for designs and illustration purposes. 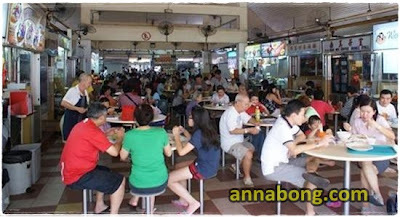 A typical hawker centre offering very affordable delicacies. If you're looking for Singaporean food, lookout for the hawker centres that is located in many corners of Singapore. Singapore's public transport is efficient and reachable to many corners of the city by MRT or buses. Even when you need taxi, the fare is quite affordable. I'm lucky enough to been to ZoukOut twice with my best companion, it is indeed an international event that is so grand and fun! You'll get to know more DJs and my favourite for now is Calvin Harris. Look out for this event every year during the second weekend of December. Many local and international artist performed in Singapore, as a hub for entertainment. January 2013: Swedish House Mafia #OneLastTour. It was absolutely epic and still so happy that I was there to witness the history. In Singapore rich with many expats, you can get not only local Singaporean/Asian food, you can get to try many authentic international food, like British, French, American, Japanese, Korean, Lebanese, etc. Ice-cream sandwich for only $1! Egg Tarts from a very traditional Chinese bakery. Many of you may have heard about the infamous macaroons from Paris, Laduree. It is now available in Singapore! All in all, Singapore is a nice place for a short breakaway, that you get to see, feel, eat, and experience a lot of things. If I return to Singapore, it would be all because of the 8 points mentioned above.